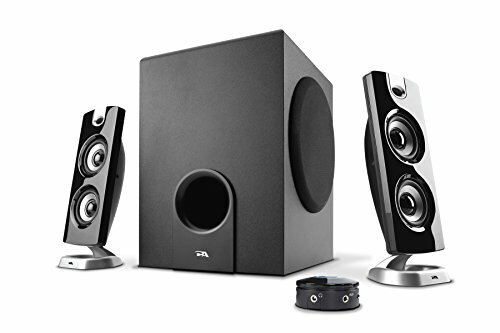 Great speakers enhance the quality and clarity of your electronic devices. But when selecting new speakers for your devices, you need to be aware that the type of speakers you invest in will impact your audio experience. Many believe that price dictates quality, and for sure there are many expensive computer speakers on the market. But the truth is you do not have to pay a lot of money for the best speakers for you and your particular environment. In fact, there is a threshold where ‘extra’ quality and price is wasted or ‘overkill’ if the environment doesn’t warrant the investment. When it comes to computer speakers, we firmly believe that you can get some of the best computer speakers under 100 USD. To prove it, we’ve done our research to bring you our list of the top 10 best computer speakers under 100 bucks that are on the market today. 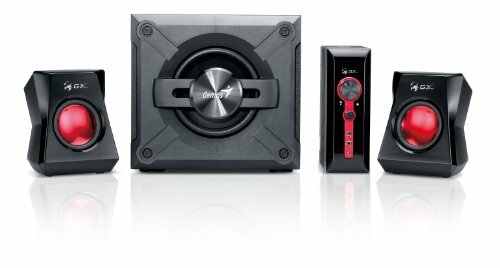 These multimedia speakers offer listeners a clear and high-quality audio performance that exceeds the performance of your system’s original speakers. 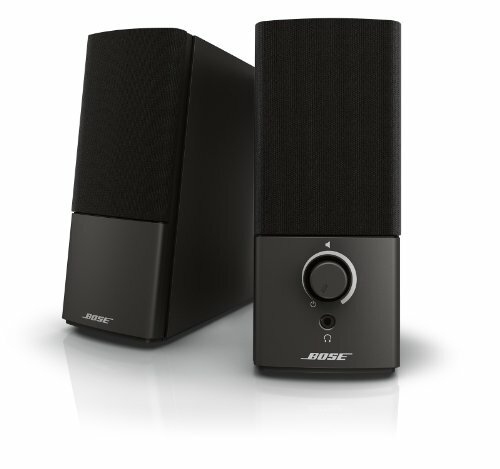 The Bose Companion 2 Series Multimedia Speakers are designed to be used with gaming systems, iPads, iPhones and computers. These are undoubtedly some of the best computer speakers under 100 bucks that money can by. Bose Companion 2 speakers provide listeners with lifelike sounds. Other features include an auxiliary input capability to use on additional devices, a headphone jack and volume control buttons that are located on the front of the right speaker. The true-to-life sound is the creation of TrueSpace stereo digital processing circuitry. Bose Companion 2 speakers are easy for users to operate. With a sleek and unique design, the Edifier USA 2.1 Speaker System offers its users clear audio output that can host multiple audio sources. This dual speaker system is shaped like two hour glass figures. The speakers contain a blue halo that is located at the smallest areas of the satellites. The blue halo alerts you when the speakers are on and ready to use with your devices. Edifier USA speakers are powered by a combined 34 watts for the speakers and subwoofer. For audiophiles who crave functionality, the Edifier Speaker System is equipped with a remote control that enables you to effortlessly maintain an ideal volume. Similar to the satellite towers, the remote control is equipped with a blue halo as well. This functional speaker system has digital signal processing and dynamic range compensation that provides listeners with a crisp audio sound. The Edifier Exclaim Bi-Amped system includes a 3.5 auxiliary cable for increased connectivity. The speakers feature 6 active speakers that provide a rich sound. 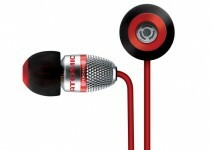 They are powered by 36 watts of voltage with bi-amped technology that provides a strong sound. The master speaker contains a volume control button that is conveniently located on the side panel. These speakers have a 48Hz – 20KHz frequency response. 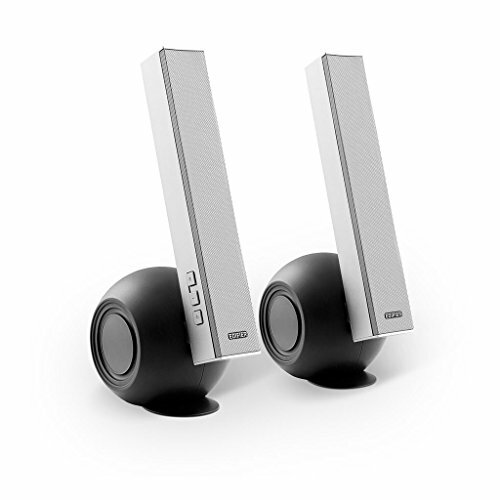 JBL Pebbles Plug and Play speakers offer a simple way for users to amplify the sound from their devices. As simple as the speakers are to operate, they provide a surprisingly rich sound. 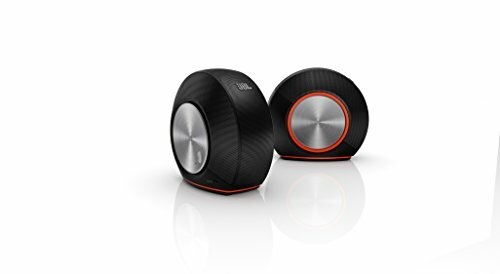 The beauty of the JBL Pebbles Plug and Play Computer Speakers is they are compact for users who like to easily transport their speakers. The speaker design includes a smart cable management system that will enable you to keep the system free of clutter. These speakers can easily be plugged into a computer device or MP-3 using an auxiliary cable. JBL Pebbles Plug and Play speakers come in a variety of colors such as black, orange, white and silver. Genius speakers offer a total output of 38 watts. The subwoofer is uniquely enclosed in wooden cabinets that provide a sound that is deep and rich. Genius SW-G2.1 satellite speakers have adjustable volume and bass controls. The speaker system contains microphone and headset jacks. Additional features include 3″ metallic driver, wall mount design, dual audio input and an individual control box. 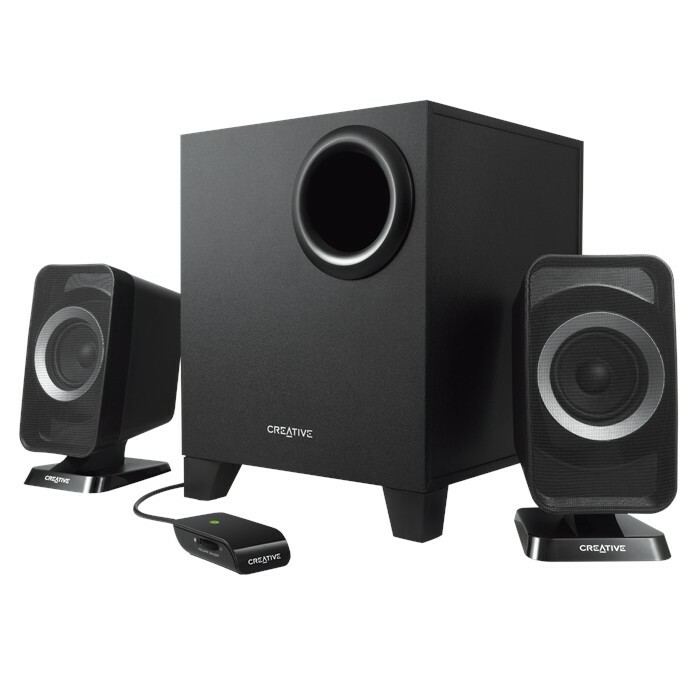 Genius SW-G2.1 speakers can be used to emit sound from computers, gaming systems, MP3 players and notebooks. 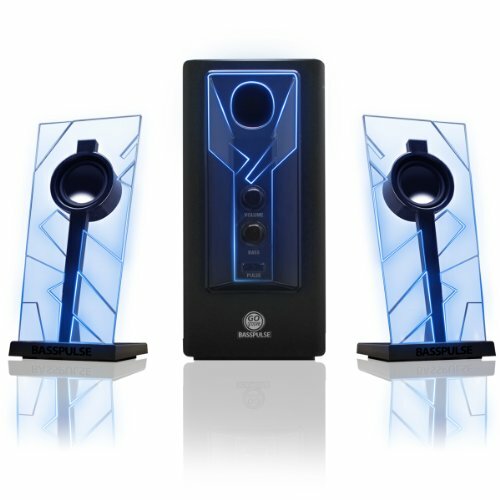 GOgroove BassPulse speakers have a bold and modern design that features blue LED lights. This 2.1 channel speaker system provides a clear audio sound through their full-range satellite speakers and subwoofer. The bass equalizer and volume can be controlled using the button on the front panel. Set up for the GOgroove BassPulse computer speakers is simple. GOgroove speakers work seamlessly with your MacBook, PC, laptop, tablets and MP3 players. Any device that has the standard 3.5mm auxiliary output has the capability to operate with the GOgroove BassPulse speakers. This Arion Legacy Speaker System proves that you do not have to pay a premium for exceptional sound quality. Equipped with a wooden subwoofer and satellite speakers, this system contains quality sound components that deliver unparalleled sound quality. 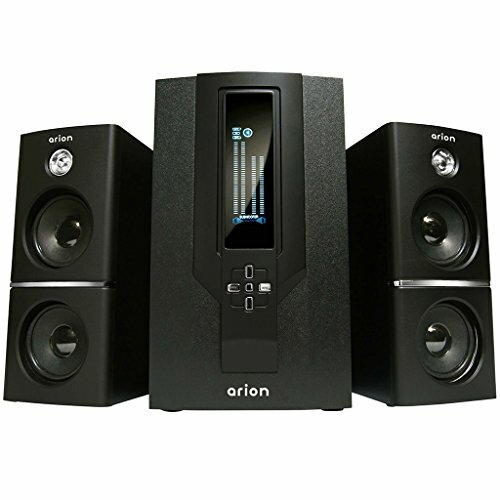 The Arion Legacy 2.1 features a digital amplifier and a wireless remote. This speaker system is powered by 35 watts. The system can be used for tablets, computers, laptops and smartphones. Cyber Acoustics provides its users with a three-piece speaker system that includes 2-inch magnetically shielded satellite speakers and a 5.25-inch subwoofer. The speaker system comes equipped with a pod enable users to control the power, volume and bass of the speakers. 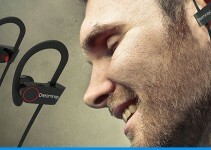 Additional features include a headphone jack auxiliary input. The Creative Wireless 2.1 Bluetooth Speaker System is compatible with any device that has Bluetooth capability. This includes tablets, laptops and smartphones. Create speakers will operate on any compatible device that is located less than 10 meters away. The developers at Creative designed this speaker system with Image Focusing Plate that provides sound with focus and tonal accuracy. A wireless remote control enables listeners to conveniently control volume and power. 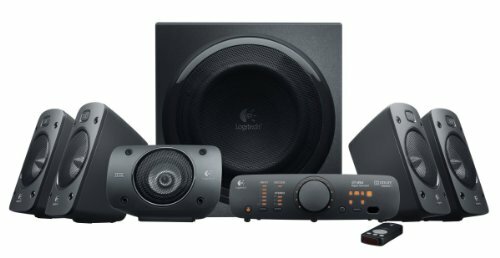 Logitech speakers feature multiple input options that enable listeners to amplify sound from game consoles, MP3 players, DVD players and computers. The Logitech Surround Sound Speakers contain 2 channel sources. Listeners will experience a 3D sound from their electronic devices. The speakers contain 75 watts of RMS power. 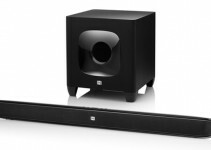 RMS enables the speakers to operate at a consistent amount of power while in use. Logitech Surround Sound Speakers have a ported, down-firing subwoofer that brings your audio to life. With all of the terminology about subwoofers, watts and input options, you may not be confident about buying speakers. Speakers can vary according to their size, output, aesthetics, quality and performance. Your first consideration should be your budget. Think about the amount of money that you can comfortably spend on speakers. If your budget is at the lowest end of the price points, there are still plenty of options that are available for you. Another thing to consider is your actual needs. It may be exciting to be able to purchase speakers with all of the bells and whistles, but do you actually need them? Make a list of your absolute necessities and try to stick to the list. Only buy speakers with features that are useful to you. A final thing to consider is usage. Will you be using the speaker system for a single or multiple purposes? If you have multiple devices, you want to be certain that your speakers will accommodate each device. 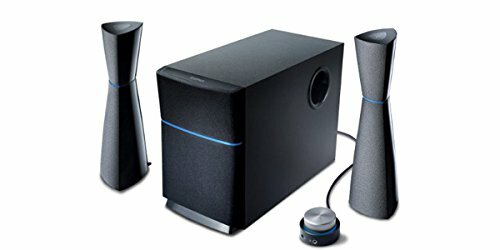 As you can see from this list, there are plenty of affordable options of the best computer speakers under 100 bucks available to meet your needs.